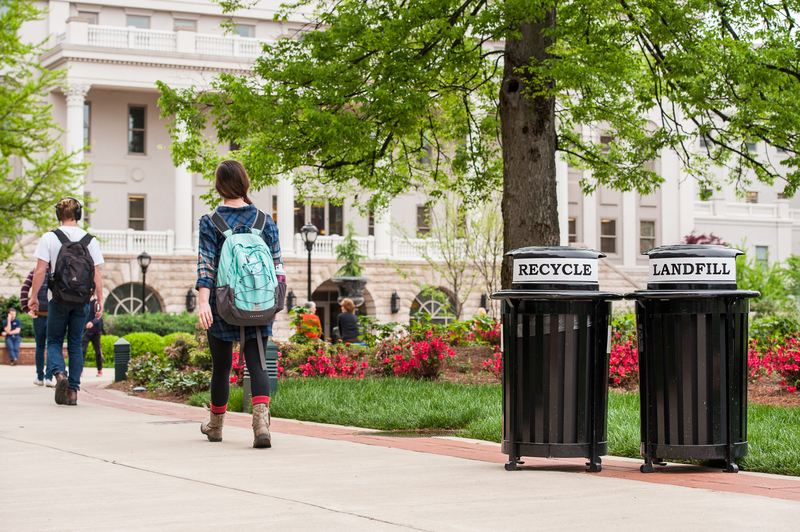 In honor of Earth Day 2015, Belmont University celebrated this week with both a special event focused on educating students about being better stewards of the earth as well as an extensive campaign dedicated to sharing the University’s own steps toward conservation in hopes to inspire others to follow suit. The celebration began today with a special convocation event that featured Blessed Earth, a nonprofit that seeks to inspire and equip individuals to understand their role in preserving the planet for future generations. Throughout the week, Belmont is sharing videos, social media posts and emails with community members to honor the University’s dedication to sustainability and stewardship. Long dedicated to “green” efforts throughout the campus, Belmont has recently transitioned to an all-encompassing sustainability initiative, known as The Conservation Covenant, to emphasize and focus plans for future progress in these areas. Historically, Belmont’s sustainability initiatives have included a number of projects that align with an overall vision to be an institution committed to stewardship and the responsible use of resources. The University’s Vision 2020, a road map that outlines the vision and goals for the next five years, lists the efficient and responsible use of resources as one of seven strategic priorities setting the foundation for the future. With initiatives led by students, faculty, staff and administration, Belmont’s Conservation Covenant has included the removal of plastic water bottles from campus, the installation of BLINK charging stations in parking garages, five educational and sustainable green roofs, campus’s recent designation as a Nashville Tree Foundation Arboretum and USA Tree Campus, light harvesting technology in the newest academic building, Gold LEED certification for the Baskin Center with Platinum LEED certification being pursued for the Wedgewood Academic Center and an innovative, interactive irrigation system that collects run-off rainwater in underground tanks and utilizes current weather data to dictate the need for water, among others. The University’s current construction project, the Dining and Academic Complex, boasts a number of sustainable aspects including a pending LEED certification application, a geothermal heating and cooling system that uses that Earth’s natural temperature to regulate interior climate and a composting system that converts food and cardboard waste into enriched soil additives through large dehydrators, reducing overall waste from food operations by 45 percent. For Environment and Conservation Organization (ECO) Club President Katie Keast, sustainable life practices were not something she was aware of before coming to Belmont to study biology with a marine biology emphasis. Since being a member of the Belmont community, Keast said she has become privy to the importance of honoring the Earth and preserving it for those to come. “It’s awesome to be at a place that shares the same appreciation for the environment. I’d like to think that someday my grandkids could go snorkeling and see coral reefs, but if humanity continues in the ways we are seeing, that won’t be possible. It’s important to protect the environment for future generations,” Keast said. Under her leadership, the ECO Club continues to develop new and creative student-led initiatives that strengthen the University’s Conservation Covenant. Belmont has created a student-produced video to highlight these sustainability initiatives and more that contribute to The Conservation Covenant. To view the video, click here.